Pet accessories have established importance in the global market in the past few years. Pet accessories are speciality products that are manufactured according to the requirement of pets such as reptiles, dog, cat etc. These accessories include a wide variety of products such as feeding, bedding products, toys and leashes. These accessories are available in pet speciality stores and retail outlets such as supermarkets, hypermarkets, discounters globally. 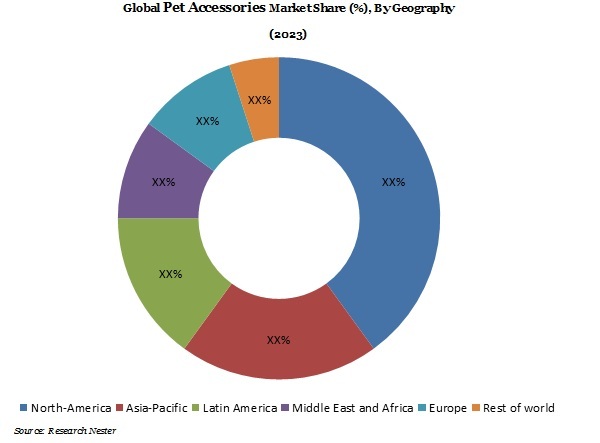 Global pet accessories market is anticipated to reach USD 22 billion by the end of 2023 witnessing a compound annual growth rate of 7% over the forecast period i.e. 2016-2023. In 2015, housing and bedding segment accounted the highest market share of 35% to the global market, the global market for pet toys is anticipated to expand at a higher pace over the forecast period. There is a rising popularity of natural and organic pet toys as they are considered to be a safer option for pets. The market for pet toys has garnered immense popularity among developed as well as developing countries. Pet toys are purchased by almost all pet owners for various reasons such as ensuring a certain level of activity for pets. Introduction of advanced cost effective pet accessories, rising concerns towards pet care, increase in health expenditure for animals, thus swelling the demand for pet accessories across the globe. Rising awareness towards health and well-being of pets and introduction of stringent regulations towards better care of animals in many developing nations such as China and U.S are likely to propel the demand of pet accessories over the forecast period. Rise in number of pet ownership and increasing concern towards health and well-being of animals among the owners are some of the key elements which are expected to bolster the demand for pet accessories in the near future. In addition to this, advancements in pet accessories, availability wide range of pet toys, rising pet care preferences by pet owners, increasing gross disposable income which has led to increase spending on pets, rising concerns towards health and fitness of pets and increasing demand in developing nations across the globe are some of the key elements expected to prompt the demand for pet accessories over the forecast period i.e. 2016-2023. On the other hand, increased pet allergies in humans are the major factor likely to inhibit the growth of pet accessories market in near future.